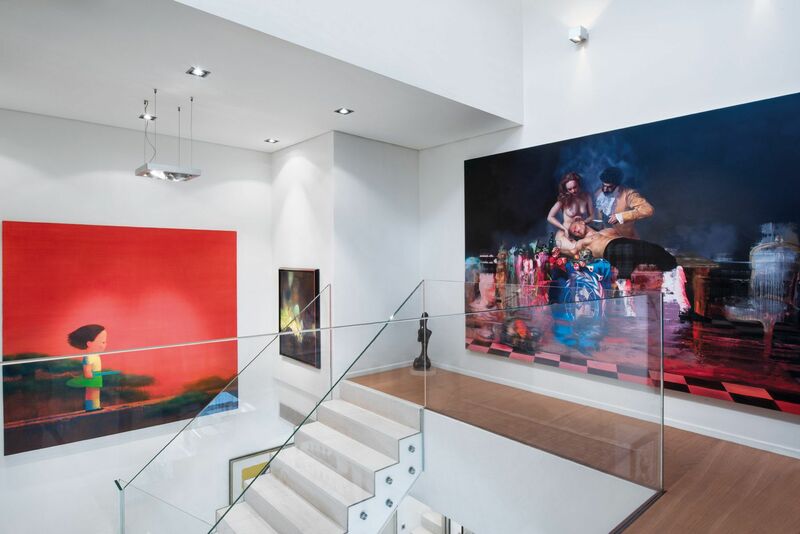 An awe-inspiring collection of contemporary art elevates this three-storey property on The Peak to dazzling new heights. Art is often one of the last things to be integrated into a design scheme, regarded as the proverbial icing on the cake when it comes to decorating. Not for the homeowners of this spectacular three-storey residence on The Peak, however, whose entire interior aesthetic was upended by the introduction of a new piece. The artwork in question is actually a pair of large-scale prints from the famed Batman Series by French photographer Gérard Rancinan, two arresting and starkly contemporary images that invite intellectual reflection and provide commentary upon modern family values. Beloved by the couple, it soon became evident that not only did these acquisitions mark a broadening of their aesthetic horizons and an evolution of their tastes, the installation of the pictures would also require a refresh of their home’s interiors. Thus began an organic progression of the couple’s abode—as well as an expansion of their already impressive art collection—that embodies their changing influences and appreciations. Where previously the generous open-plan living-dining area was dominated by Chinese contemporary artworks in a palette of muted tones and earthy browns, with dark antique furniture and a large Persian rug, the addition of the new pieces advocated a much cleaner and more cutting-edge design direction. Without changing the structural framework—which, with its white walls, glass partitions and enviable abundance of natural light, gives many established galleries a run for their money—mid century modernist-infused furnishings and works by Asian and Western artists led the way for an irresistible new look that is effortless in its elegance and timeless in its appeal. As ardent hosts, the enormous 12-person dining table and sunken living space flanked by sleek, high-performance speakers from Italian audio-design brand Nime provide the ultimate area in which to entertain. Pieces by British graffiti artist Banksy, American pop artist KAWS, contemporary Chinese talents Yue Minjun and Zhang Xiaogang, and pioneering Korean video artist Nam June Paik set a soulful tone, welcoming contemplation, introspection and dialogue—at once singular in their impact on the interiors and cohesive in the way that each work complements the others and its environs. In an abode that is as visually rich and as this, it is near impossible to illuminate one area over another. However, the glass-edged staircase that intersects the home and connects its trio of levels demonstrates a particularly elevated artistic and aesthetic literacy. Grand, vibrant canvases draw the eyes up to the top floor, where the bedrooms and study are located, and down to the lower layer, where you find the guest suite, television room and wine cellar. Among these artworks are pieces by Andy Warhol, Niclas Castello and Takashi Murakami, all of which communicate the couple’s fluency in contemporary art, regardless of its provenance. Just take the skylit atrium on the uppermost level as an example, where a pair of paintings by Irish street artist Conor Harrington hang, depicting dramatic, cinematic scenes in oil and spray paint. They are bold, commanding and powerful, yet they assume their position in this family home with ease, adding texture, colour and a narrative to an often-undervalued space. Indeed, it is the role of art in an interior’s success that this home observes and honours. Each piece welcomes you to take a moment’s repose, at the same time stimulating creativity and inviting you to really experience the space you are occupying. By filling their home with pieces that they value visually, this couple has conceived an abode that any aesthete can enjoy.